Abby and I took turns riding the giant jackrabbit at the Jackrabbit Trading Post in Joseph City, Arizona, on our first vacation together, The High Road. You can see my video camera, the Canon Optura 200, in my hands. 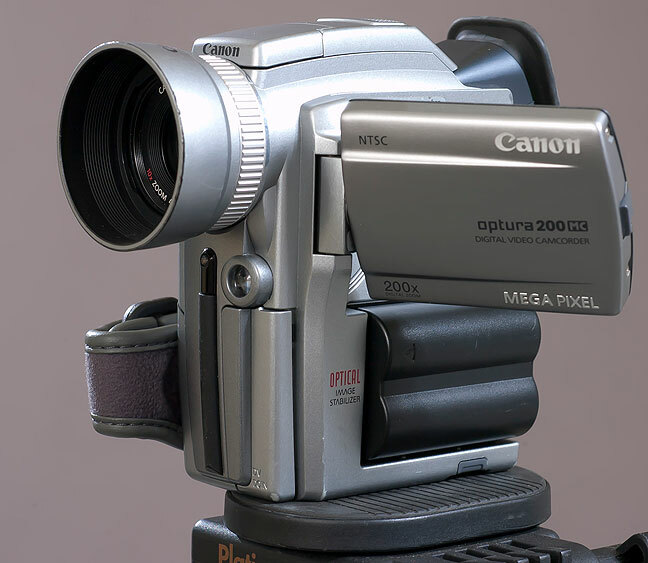 This is the Canon Optura 200 DV camcorder of 2003 vintage. In addition to making only mediocre video, the microphones on this camera are poorly positioned, and pick up a lot of operating noise from its internal mechanism. In addition to the hundreds of great images we both made on that trip, we also made video, using a camcorder I bought on sale just before the trip, the Canon Optura 200. I owned a bigger, heavier, decidedly better camcorder, the Canon GL-1, but I was really interested in traveling lighter. The Optura was the answer. At the time, the computer I used was an iMac, and I edited the video from that trip using one of the first versions of iMovie, which had some limitations, particularly in audio editing. The result was that I had to leave out some clips with poor audio. The High Road was a “map trip,” meaning we based the majority of our destinations of items we found on the map. We saw a lot, and went father and did more than we expected when we started. During that period it was my custom to create two videos from a trip, one “feature length,” maybe 15 or 20 minutes long, and the other a “preview,” meant for the web only, typically under two minutes long. For The High Road, I made both, but I only saved the preview in very low resolution. For some time now, in the era of much better video editing software, I have wanted to reassemble the preview for The High Road, and today I finally finished it. Although our theme song was Crystal Baller, I used another Third Eye song, Jumper, for the preview video. You can see from watching the preview that we saw and did a huge number of things, and that we are over-the-top happy to be on the road together. Lot of joy in that little video.